We’d love your help. Let us know what’s wrong with this preview of The Ivory Carver Trilogy by Sue Harrison. In Mother Earth Father Sky, it’s 7056 BC, a time before history. On the first day that Chagak’s womanhood is acknowledged within her Aleut tribe, she unexpectedly finds herself betrothed to Seal Stalker, the most promising young hunter in the village. A bright future lies ahead of Chagak—but in one violent moment, she loses her entire way of life. Left with her infant brother, Pup, and only a birdskin parka for warmth, Chagak sets out across the icy waters on a quest for survival and revenge. In My Sister the Moon, Gray Bird wanted only sons. His daughter, Kiin, would have been killed at birth to make way for a male heir if not for the tribal chief, Kayugh, who claimed the infant as a future wife for one of his two young sons. Sixteen years later, Kiin is caught between the two brothers: one to whom she is promised, the other whom she desires. But the evil spawned by her own family takes her far from her people to a place where savage cruelties, love, and fate will strengthen and change her, and lead her to her ultimate destiny. To ask other readers questions about The Ivory Carver Trilogy, please sign up. Another interesting story. Slow moving in areas but well-written and I had to finish the story. I enjoyed this book, as far as I got... I'm almost ashamed to say that I didn't complete it! 😞 To be honest, mid-way through the second volume, it (for me) became quite boring and almost repetitive. One of your reviewers got it right, by saying "it's not the Clan of the Cave Bear Series." - I get it, it's probably not meant to be but, if that's the case, why does it try so hard 'to be?' Some of the plot-lines are very similar but, again, for me, are not so convincing or engaging as COTCB. They d I enjoyed this book, as far as I got... I'm almost ashamed to say that I didn't complete it! 😞 To be honest, mid-way through the second volume, it (for me) became quite boring and almost repetitive. One of your reviewers got it right, by saying "it's not the Clan of the Cave Bear Series." - I get it, it's probably not meant to be but, if that's the case, why does it try so hard 'to be?' Some of the plot-lines are very similar but, again, for me, are not so convincing or engaging as COTCB. They do not 'draw-in' the reader in a way that one almost 'owns' the prose in the way that COTCB 'certainly' does. So much so, that once having read the series (COTCB), one wants to read it 'all over again!' I don't think the Ivory Carver Trilogy has that power, or instills in the reader that same kind of ownership of the 'Love' of the prose; plot or characters? Well, the 5 stars pretty much say it all cause I don't give many. I also don't often read trilogies complete, but this one sucked me in and would not let me go. I will miss these characters! Such a great read! Loved it but nothing will ever beat the Clan of the Cave Bears series. I have not read a book about early people in years, I have read a lot in the past. I felt this book was well done, the end was predictable but that's ok with me. I enjoyed the intertwining of people and stories and they were done well. I thoroughly enjoyed the book(s). Fascinating, engrossing, captivating, suspenseful, all barely describe each of these connected stories. Who could believe people living 7000 BC could be so interesting. Can you imagine women living barefoot in Aleutian Islands,wading out in those cold waters to launch their boats, commonplace to find food, prepare it, store it, while caring for menfolk and babies! One of my favorite in the "prehistory" genre! Not as 'true-to-life' as, say Jean Auel or Linda Lay Shuler, magic weaves in and out of this epic and it seems to be based on some legendary ancient story I've not heard of, but it's a lovely and gritty exploration of hard life in a magical, ancient world! I fell in love with the historical approach to a rich story of native people, entrenched in all the trimmings of humanity. I loved the rawness of each of these stories. Brilliant book I have read Jean M Auels books about 10 times I so enjoyed them this trilogy is just as good if not better never thought I'd say that. Just started next trilogy. I enjoyed this, learned some while reading. I did get really tired of the length of the abduction and torture components. I occasionally thought of giving up on the story, particularly once I got to book 2, but I'm glad I plowed through the tough parts. It was a tough life and time. I enjoyed seeing the different lifestyles across communities and the differing roles of women and the strength of the women. I enjoyed the first book in the trilogy. The author does a fabulous job of giving you information without being tedious about it. The story was interesting and moved along nicely. It gives you a nice feel for what life might have been like in that time and place. By itself, I would have given it a 3.5 or 4 star rating. The next two books in the trilogy were just unrelenting misery, almost seeming like a bad soap opera set in the Aleutian Islands around 7000 BC. Great read with a depth of knowledge about life in early Alaska. Or at least I assume so. I'm not in a position to critique the accuracy. Started out strong with the first book. Started to get repetitive and pretty sad near the end. Sue Har Sue Harrison is the author of six critically acclaimed and internationally bestselling novels. 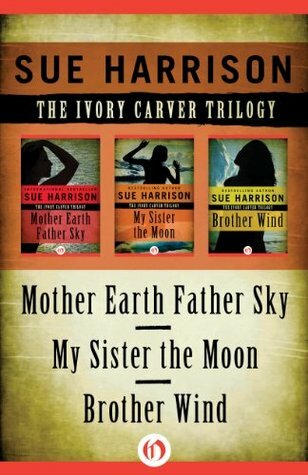 Mother Earth Father Sky, My Sister the Moon and Brother Wind make up The Ivory Carver Trilogy, an epic adventure set in prehistoric Alaska. Song of the River, Cry of the Wind and Call Down the Stars comprise The Storyteller Trilogy. Sue’s young adult book, SISU, was released by Thunder Bay Press .